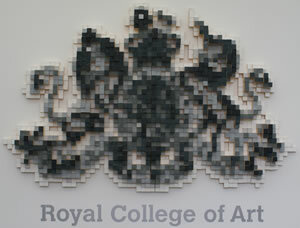 We attended the end of year show for the Royal College of Art (RCA) and were highly impressed with a lot of it. While I personally thought that the fine art side of the exhibition was too safe and ultimately unexciting – it felt like they were all being too conscious of trying to ‘make it’ – the work in the Great Exhibition tent was very stimulating – bright minds tackling issues that are just ahead of current issues, and a few, a long way off. Within this area, for me, there were two main themes to the show – a desire to use technology, but , as far as possible, to hide away the fact that technology is involved from the experience of using the device – and a consciousness of making the designs have the lowest possible impact on their environment (green issues, if you like). Over the next 12 days, we’ll bring you one designer a day and hope you find them as stimulating as we did. The first is Adrian Westaway and his Magic Light. We’re going to be trying a new format with these RCA pieces. Rather than have text dominated reporting, we’re going to have the audio and picture do the speaking. Let us know what you think of the new approach.